6 pairs of Original Night Ice crystal LED earrings! 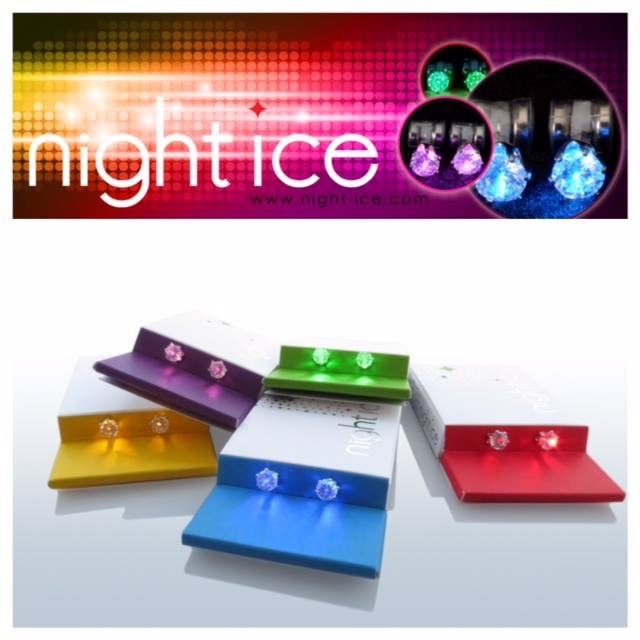 Original Night Ice ® light up earrings come in 6 vivid colors! Our San Francisco-based company brings you Original Night Ice light up earrings that project positivity and light up any situation. Red, white, blue, green, purple and classic white. Collect the whole set of the Original style and light up every party! 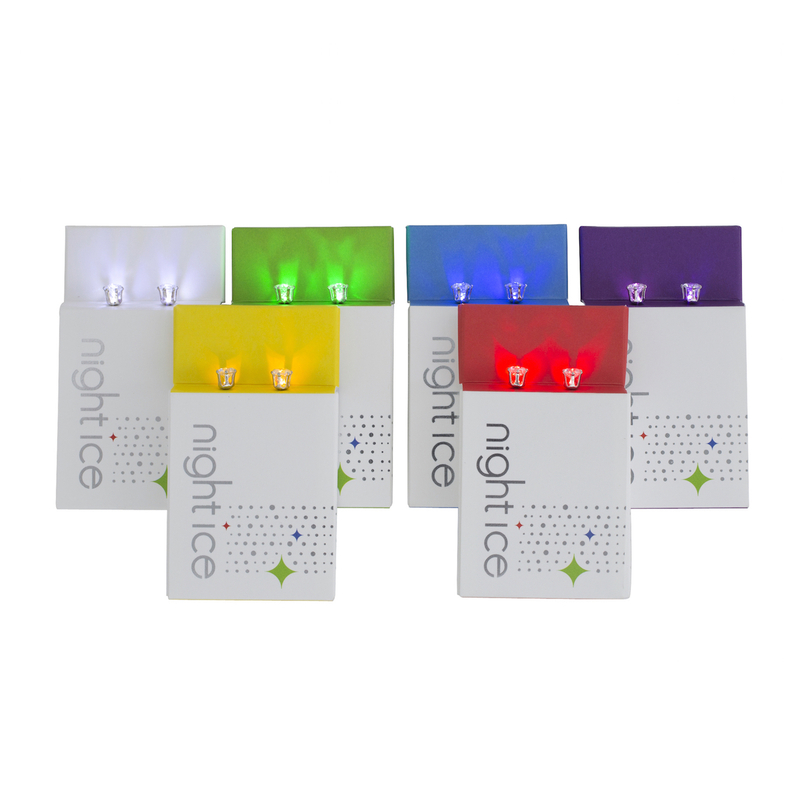 This offering is all 6 Original Night Ice LED earring colors, 1 pair of each Original color. Night Ice crystal light up earrings start with a brilliant crystal stone. Our sparkling crystal stones are brilliant in the sun when the light isn't on. Then tighten the battery backs when it's time to shine. Night Ice LED earrings are stud earrings with posts (for pierced ears) for both men and women. When you add the batteries, LED light shines through the crystals! They also come with regular backs for wear as standard crystal earrings. Each pair of Night Ice earrings comes with pairs of batteries. Each pair of batteries lasts about 30 hours. Night Ice crystal LED earrings are perfect ice breakers and they give off good vibes. You'll stand out in the crowd and have a major advantage. Wear your Night Ice light up earrings as sparkling crystal earrings during the day. Then turn on the LED light at night! Night Ice LED earrings light up when you want them to. Glow in the dark earrings are perfect for concerts, parties and sporting events. Light up the room and take your outfit up a level. 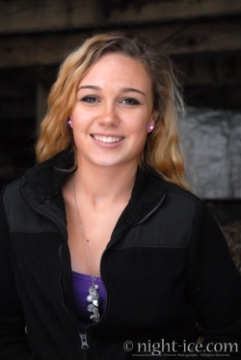 Night Ice LED earrings are perfect gifts for men and women of all ages! The complete set of Original Night Ice LED earrings! 1 pair of each color. You can't fade the whole set! Lace up all your friends. With all 6 Night Ice LED earring colors you'll be strapped with light up earrings for every jubilant occasion. Represent your favorite sports team. LED earrings make perfect gifts and party favors! LED earrings project positivity and make people feel good. Hit the on button and then hit the dance floor! You'll light up the party while keeping it extremely real. Glow in the dark earrings are hater proof. LED earrings are perfect for men and women of all ages. Wear them as sparkling crystals without the batteries. Then light them up when it's party time! Light up earrings are perfect gifts and they're party and dance floor essentials. Pop a bottle! Each pair of light up earrings comes with 2 pairs of batteries. Batteries last over 30 hours! Check out the blues and the purples in action! Glow in the dark jewelry is next generation bling. Get your shine on. It feels good! With the complete set you can represent any team or school! There's nothing better for championship games. LED earrings make perfect gifts for rabid sports fans and they're unbeatable at ballgames. They worked for the Giants! Light up earrings enhance your outfit and your mood and basically give you super powers. Like those crazy magnetic necklaces and bracelets. Feel the power. Shine the light. Sport red, white and blue in honor of our favorite seal team. God Bless America! Use promo code 415 for 10% off in addition to the discount for purchasing 1 pair of each color in one package! Double win. Get yours. Wow! Wear new Night Ice crystal LED earrings as dazzling crystals during the day or night. LED crystal earrings will absolutely come in handy. They help people make friends, strike up conversations, and get noticed. Night Ice LED crystal earrings come in 6 vivid colors; sapphire blue, red, green, purple, yellow, and classic white. You want your earrings to dazzle and shine, even when it's pitch black. 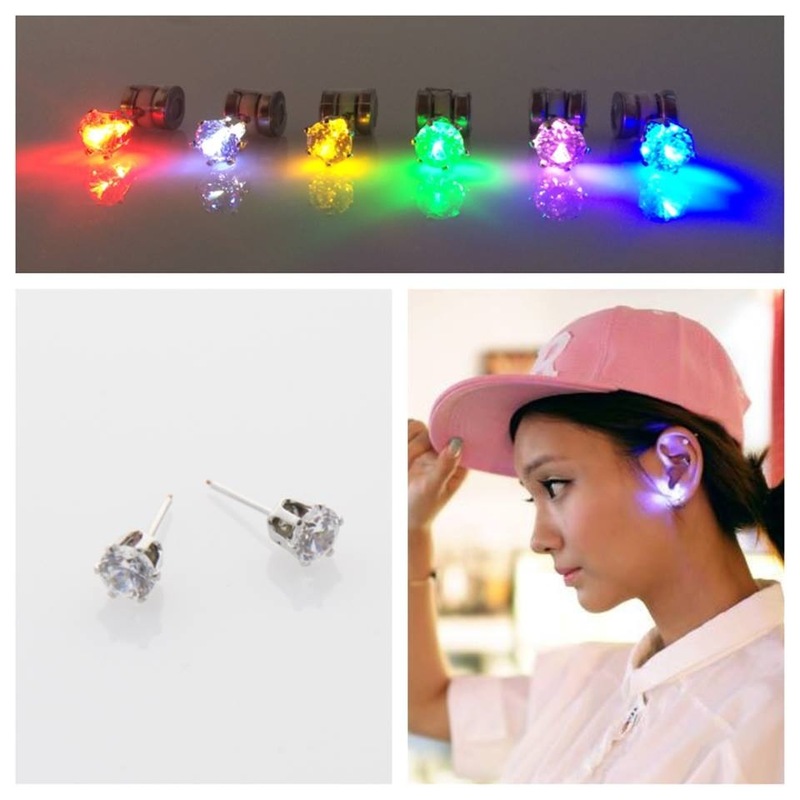 Night Ice LED crystal earrings are so fun at night because you can easily see your friends, girlfriend, or kids. They're super safe and fun because people can see where you are. It's light safety for your ears! Night Ice LED crystal earrings will definitely make you look high tech! 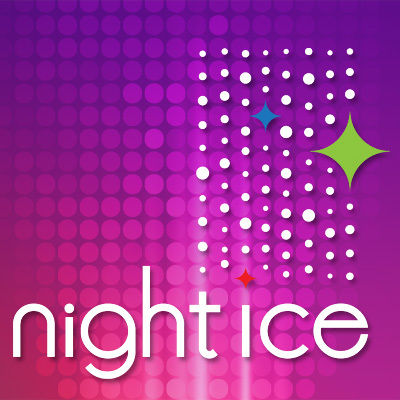 Kim "Skipper" Corbin gives a glowing review of Night Ice LED earrings. Super clutch accessories are made only in San Francisco, California. Shaped like normal diamond jewels that can be worn on a day-to-day basis, our light up earrings have an LED light that glows brilliantly when the wearer turns them on. Choose from blue, red, green, purple, yellow, and classic white light, and rock these jewels to the parties and nightclubs; everyone will be stunned by their vibrancy and will want to know how your glowing gems light up in the dark! There are small batteries included as the backing for each earring, and these are covered in rubber so they do not come in contact with skin. These LED crystal earrings are sure to be the most stunning bling in any room!